This easy sweet potato recipe, aka Süßkartoffeln, is a great side dish for any meal, German or not. It's just become a favorite recipe of mine - a variation on one I learned from my daughter-in-love, Sylvie. 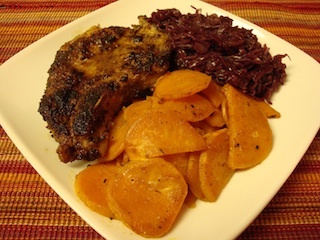 And it fits so well with German breaded pork chops (a type of schnitzel recipe) and German red cabbage. It's also great with oven-fried chicken, especially since they can be cooked in the oven at the same time. So easy and so quick to make. No, it's not German. 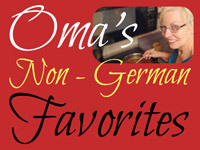 That's why it's listed under the Oma's Quickies page. Into large plastic baggie (large enough to hold sweet potatoes), put olive oil and seasoning. Mix (by squishing bag). Pour potatoes onto large baking sheet and spread out. Add 8 - 10 garlic cloves with the potatoes in the bag! Yummy! Sweet potatoes are certainly not part of traditional German cooking. However, as the world becomes more and more global and as more and more immigration occurs into Germany, what is now found in Germany is totally different to years ago. If you're looking for other sweet potato recipes, be sure to try Sylvie's sweet potato salad. A favourite of ours. As you try the recipe above, I'm sure you'll come up with your own combinations that will delight your family. If you're into roasting veggies, you'll find that most recipes call for putting a bit of oil in the bottom of the baking dish and then adding the cut up veggies. Drizzle with some more oil. Roast. Sounds easy enough, doesn't it. How can that be any simpler? Well, I soon realized that drizzling with oil didn't cover all the veggies unless I really poured lots all over. Easier? Well, take a largish plastic bag (I use bread bags or milk bags) and put the cut veggies into that. Pour in about ¼ cup olive oil (I always use light). Now, gently mush the bag and all the veggies will get coated in the oil. You can also add seasoning to the bag. When all is mixed, spread onto baking sheet. Roast. This uses way less oil and it nicely coats everything. "Just as damaging as a madman shooting a deadly weapon is someone who lies to a friend and then says, “I was only joking."